There were 635 press releases posted in the last 24 hours and 153,945 in the last 365 days. "/EINPresswire.com/ Augusta, GA - March 27, 2013 -- Glyn Howard, science teacher/meteoritics scientist, discovered, mapped, collected, and classified a new world record Mars meteorite find with more collected TKW than the Apollo Lunar Rocks. This discovery shatters all Mars achondrite records. This is a discovery of price-less scientific and monetary worth. USA's most valuable collected natural treasures are the Apollo Moon rocks, valued at $50,800/g, with a total mass of about 382Kg. This Mars discovery is more mass than all Apollo mission Moon rocks combined. 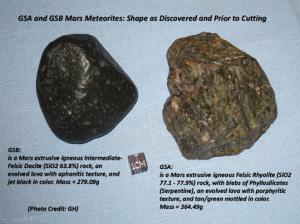 (Mars meteorites are not valued at $50,800/g.)" In honor of this upcoming Jewish High Holy Days ("Days of Awe"), September 2014 Season, Rosh Hashanah (5774 – 5775 CE/AD), Tashlikh, and Yom Kippur, the empirical evidence to prove this incredible scientific discovery is given. This U.S. World Record Mars Meteorite Discovery is true as originally announced. And it's possible to do the following three things: shatter all existing Mars achondrite meteorite World Records, prove this incredible scientific discovery that has price-less scientific and monetary worth, and do the right thing through monetary rewards that can help many people through the funding of many important social justice causes for all. Tikkun olam. It's The Peoples' National Treasure, therefore The People are to benefit.